Aboard ship there’s a danger in having too much of anything for then one is bound to have too little of something else. — William Brown, Botanist, Mutiny on the Bounty (1962). Spacecraft designers say similar things. The same holds true for product design – everything must be in balance. 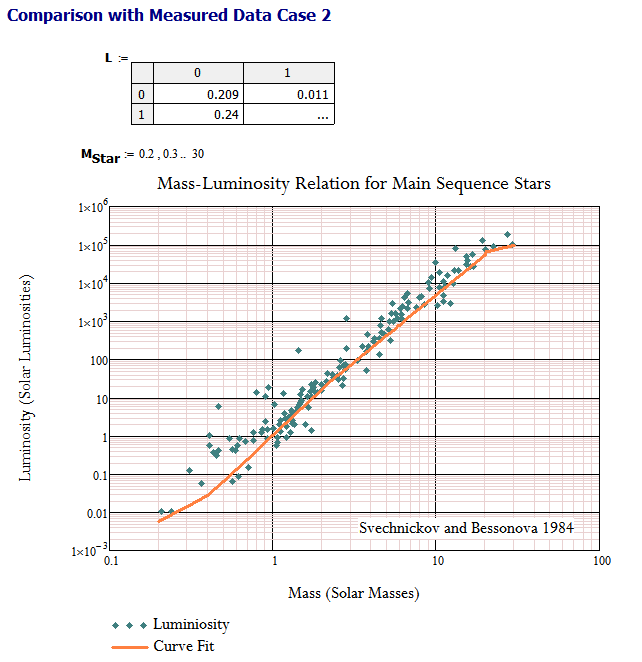 Figure 1: Luminosity vs Mass Chart (Source). 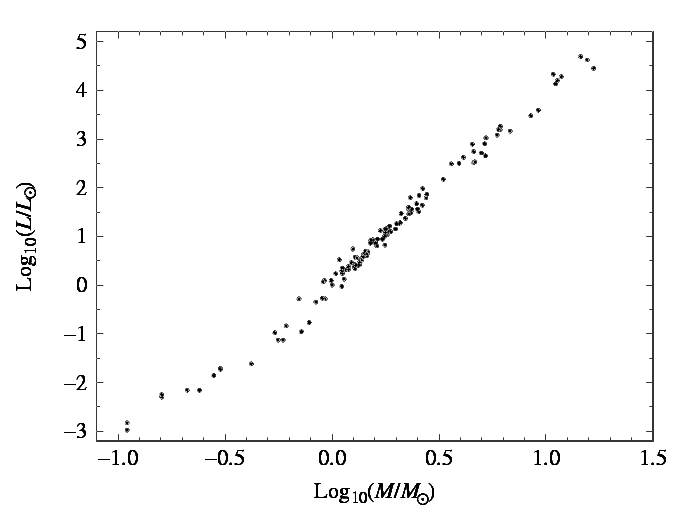 A reader mentioned to me that the Wikipedia has a good entry on stellar luminosity versus stellar mass – I can confirm that the entry is a good one. I thought I would compare the empirical relationship shown in the Wikipedia with a couple of different data sets that I found on the web. I was motivated to perform this analysis because: (1) I have been doing some reading on exoplanets, and luminosity is important when it comes to exoplanet temperature; and (2) I am presenting a seminar on Mathcad to our engineering staff, and this application provides me a nice demonstration on how to compute nonlinear piecewise functions. One of my goals with these Mathcad training sessions is to show our staff that math can be well documented. This battle for clarity also occurs with software source. My first comparison data set is shown in Figure 1, which is from an instructor's web page at Case-Western Reserve. I also found a very poor quality copy of a diagram from a research paper by Svechnickov and Bessonova (1984). I digitized both figures as well as I could using Dagra. I will graphically compare the Wikipedia's luminosity versus mass relationship with the two different sets of raw data. The digitized versions of this data are shown below. 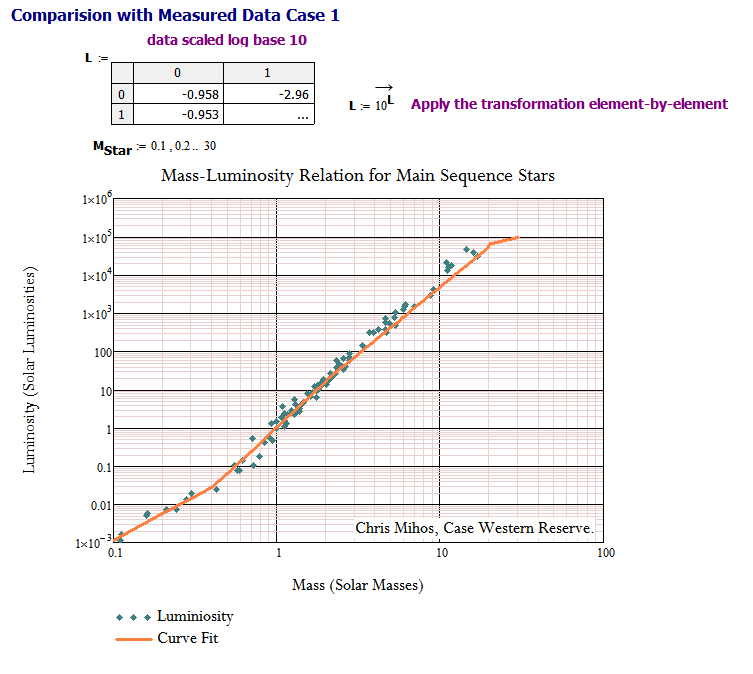 Figure 2 shows how I implemented the complex luminosity versus mass model using a simple Mathcad program. 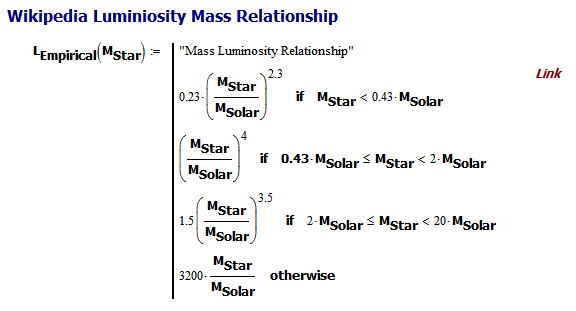 Figure 2: Mathcad Implementation of Luminosity vs Mass Relationship. Figure 3 shows how well the Wikipedia model matches the data from Figure 1. The agreement looks pretty good. Note that the original data was transformed using a base-10 logarithm. For my purposes, I need to undo this transformation. This transform was accomplished efficiently using an array function. Figure 3: Model vs Data Set 1. Figure 4 shows how well the Wikipedia model matches the data from Svechnickov and Bessonova (1984). The agreement also looks pretty good. Figure 4: Model vs Data Set 2. Capturing a relatively large data set from rough drawings. Applying an element-by-element transformation to each element of an array. Creating a program to compute a nonlinear piecewise function. Plotting both the data and model for direct comparison. This entry was posted in Astronomy, General Mathematics. Bookmark the permalink.